Penazzi is a collaborative effort. Its success may equally be attributed to charismatic owner, Gabriele Penazzi, as well as to gifted head chef, Effron Flores. This ‘dream team’ works in tandem to create the special tastes that emanate from Penazzi. Gabriele was born in northern Italy. He is from Imola, where the regional style of cooking is rustic, and the area is best known for their Formula One Ferrari racetrack. He went to university in Italy, completing a degree in biology, and didn’t arrive in the United States until he was in his mid 20’s. 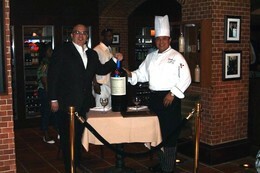 Chef Blas Effron Flores has an extensive culinary background, and manages a hectic schedule at Penazzi. He graduated from the Los Angeles Culinary Institute, and has specialized and honed his skills in Mediterranean cuisine. Prior to joining Gabriele Penazzi, he was Executive Chef for the Grove Garden Bistro. He’s received a number of culinary awards, as has served as a creative contributor to the menus of Bertolini’s at Caesar’s Palace, Valentino’s & Zeppirini’s at the Venetian and Ruffles at Mandalay Bay. I met with both of them to talk about the food served at Penazzi. Gabriele, are you a chef as well? (Gabriele) I can cook. My family (in Italy) has a restaurant, a bar and a pastry shop. I began working in market space at the produce market at the age of 9. (Gabriele) I was 28 when I came to the United States. I was, and maybe still am, hard headed, and up to date on Italian trends, especially cuisine. (Effron) We put a modern spin on classic dishes, to make them more exciting. How do you create dishes? Does it take more than one try to get just the right taste? (Gabriele) I have family recipes that we use. (Effron) We make them many times, and Gabriele tries each one. This way we arrive at a menu together, and our dishes are always exciting. We made and tasted lamb many, many times, until Gabriele though it was just right. How does Penazzi’s menu change? (Effron) The menu changes seasonally, so that we always feature what’s the most fresh and in season. We also have new specials daily. Effron, you’ve been here from the beginning; what’s new and changed? (Effron) I’ve been here as long as the restaurant. The oyster bar was my idea, and it’s done really well. We have our seafood flown in daily, so it’s always fresh. What’s your favorite dish, and are there any foods that you dislike? (Effron) Of the meat, my favorite is the rack of lamb. My favorite signature dish is the Petto di Pollo alla Sorrentina (chicken breast with eggplant, peppers & provolone in a marsala sauce). I don’t really like frog legs.